Castles will be rising on the Fairfield shoreline this weekend, but unlike centuries-old citadels and fortresses, they will not withstand the tests of time. In fact, just the opposite. They will be swept aside by time and tide. Quite literally. That's because these shoreline strongholds -- some fantastical, others just fun -- will be fashioned entirely from sand during the 3rd annual Sand Sculpture Festival at Penfield Beach, organized by the Fairfield Beach Residents Association and the Inn at Fairfield Beach. The main attraction of the event, which runs from Thursday through Sunday, will feature a massive sculpture made from 10 tons of sand by Sean Fitzpatrick, a master sculptor and founder of Fitzy Snowman Sculpting in Saugus, Mass. He begins prep work on the massive maritime-themed sculpture Thursday morning, and serious down-and-dirty sculpting gets under way Friday. Fitzpatrick's masterpiece is expected to be largely completed by Saturday afternoon. Meanwhile, a boat-load of other activities will take place throughout the weekend. 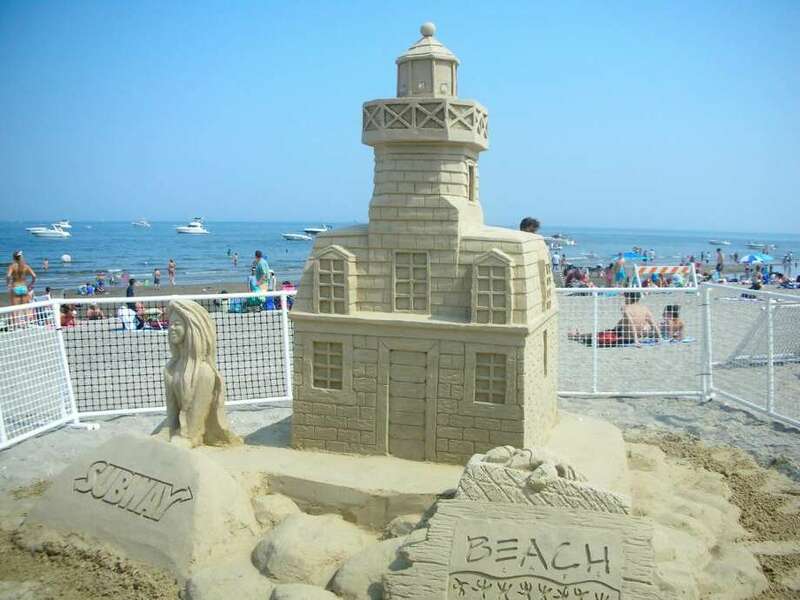 "¢ On Friday, CancerCare and Dr. Ivan Cohen and Associates will offer free skin cancer screenings from 1:30 to 3:30 p.m.
"¢ On Saturday, the Fairfield Police Athletic League will sponsor its annual Sand Sculpture Contest for amateurs on the Penfield sandbar from 1 to 3 p.m. There is no entry fee, but registration is required at 12:30 p.m. Look for the PAL sign on the Penfield deck to sign up. Amateurs may register as teams or as individuals. Individuals must be 18 years old or younger and teams must include at least one member who is 18 or under. Only objects found in nature may be included in the sculptures. Participants should bring any tools that they'll need to create their sculpture. Prizes in the PAL contest will be awarded in the following categories: Best Castle, Most Original Sculpture, Most Realistic Sculpture and Most Artistic Creation. "¢ Yoga for Everybody will offer classes on the beach for $10 at 7 a.m. both Saturday and Sunday on the deck of the Jacky Durrell Pavilion. "¢ Subway's "Subman" will be at the Durrell Pavilion starting at 11:30 a.m. Saturday with giveaways and other fare. Gigliotti & Walsh Fine Properties will hold a coloring contest with a grand prize. "¢ Carabiner's Indoor Climbing of Fairfield will set up a portable rock climbing wall stationed next to the Durrell Pavilion starting Friday. Donations for climbing will be collected for CancerCare and the Fairfield Beach Residents Association for beautification of the new Penfield II. Suggested donation is $5.